The next generation alarm clock and internet audio media streamer that lets you access 20+ streaming apps including iHeartRADIO, Spotify®, Pandora®, SiriusXM®, Slacker Radio, TuneIn and more while serving as a convenient multi-tasking tool. Aluratek's WiFi Internet Radio Media Player with 7" Touchscreen Display is the next generation internet audio media streamer that lets you access any app from the Google Play Store. Instantly access your photos, music, videos and YouTube from the home screen tiles. Customize your home screen apps to anything you want up to six favorites. Use can also use your radio as a convenient multi-tasking tool utilizing clock, calendar, weather, alarm, social media and memo apps to help you through your day. The WiFi Internet Radio Media Player features a large 7 inch vivid color touchscreen LCD (1024 x 600) that provides fast and easy navigation through the app based menus. Easily swap out up to six favorite apps on the home screen. Icons at the bottom of the screen will allow you to access the home screen, control the volume, back menu and task switcher. In addition to the touchscreen display, you can control the WiFi Internet Radio Media Player with the push button controls on top of the unit that allow you to power ON / OFF and control the volume. AIRMM04F features dual (5W + 5W) front facing channel speakers that provide superior sound quality and the best listening experience possible in a small yet powerful footprint. Ideal for instances where you want to add audio quickly and easily to a room. Bring it into the kitchen to listen to a iHeartRadio podcast while cooking. Take it to the garage to groove to your favorite Pandora station while you work. Wherever it goes, you can be sure the WiFi Internet Radio will fill any room with dynamic, rich sound. Stream thousands of radio stations, listen to your favorite sports program, get the latest news updates or stream your favorite podcast with iHeartRadio, Pandora®, Spotify® and more. Access YouTube to enjoy an endless number of videos. Access your digital files from the Google Photo and Google Play Music apps. 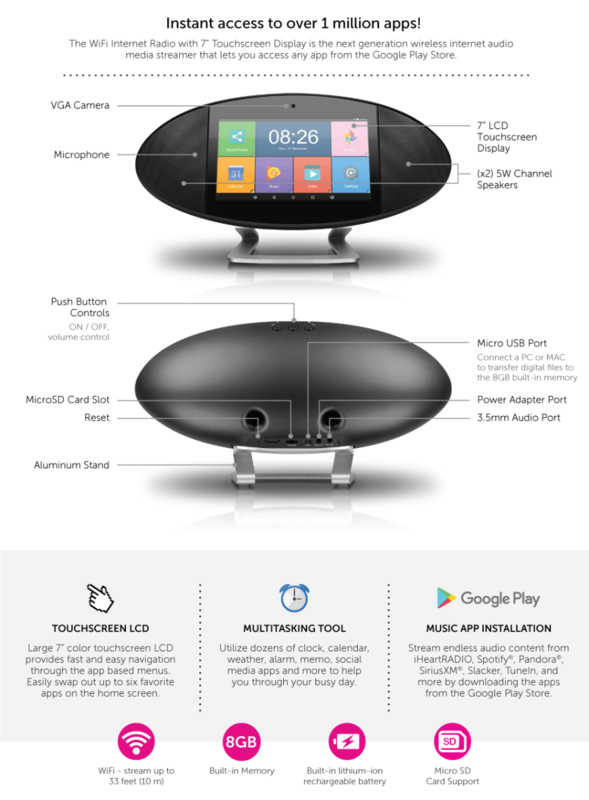 The WiFi Internet Radio Media Player connects easily to any WIFI 802.11 b/g/n wireless network so you can instantly enjoy your digital photos, music, video and radio content. Insert a MicroSD card (up to 32GB) in the integrated card slot to access your digital media. You can also connect a PC, MAC or other music source to the media player's USB port to transfer files directly to the radio's 8GB built-in memory. A 3.5 mm headphone jack is conveniently located at back. The Media Player also features a built-in front facing camera so you can enjoy video conferences and video calls with apps like Skype, WeChat and Line. Easily access social media apps such as Facebook, Twitter and Instagram. Keep you photos and videos within reach with the Amazon Drive, Gallery and Flikr apps so you can access your digital content anywhere you and your internet radio go. Use your radio as a convenient multitasking tool by utilizing the dozens of clock, calendar, weather, alarm and memo apps. Weighing just 2 pounds, the WiFi Internet Radio Media Player is extremely portable making it easy to place in any room. The built-in rechargeable lithium-ion battery allows for up to 5 hours of streaming on a full charge to help you through your day. Easy access to social media apps such as Facebook, Twitter and Instagram.